The small estate winery was established in 1998 and specializes in limited production of estate grown, hand-crafted wines (table and sparkling wines). Sold by the original partners in 2008, the new owners plan to utilize the new and old vineyards to continue to produce the Gamay, Chardonnay, and Riesling types of sparkling wines for all guests to enjoy. In spring/summer 2009 the winery plans to move from the Jordan location to 4th Avenue in St. Catharines to a newer facility with state-of-the-art winemaking equipment. This new winery will provide an area for wine tastings and private events can be held in the area. Even with the new building this winery expects to keep both production facilities to help increase overall production of the fine wines from 13th Street Winery. Located on the current site of the winery, this vineyard was originally planted in 1976 and was replanted in the 80’s and again in the 90’s. The main varietals grown include Riesling, Pinot Noir, Chardonnay, Merlot, Sauvignon Blanc, and come other vinifera grapes. The fantastic soil at this located help the grapes produce great flavour and character. Located on the site of the ancient Lake Iroquois this vineyard is situated in Lincoln Ontario on 5th Avenue. June’s Vineyard was planted in 2001 with Clone 49 Riesling, Chardonnay, Cabernet Franc and Cabernet Sauvignon varietals. This vineyard will be the home of the new winery in 2009 and is one of the newest vineyards owned by the 13th street winery. Pinot Noir, Clones 115, 777, 667, and 828 have all been planted in 2007 and 2008. This vineyard produces all the varietals in limited yields to help the grapes produce fantastic flavour. A 25 acre vineyard that has 7 acres of Gamay vines planted with more vines expected to be planted. These two vineyards are located east and west of the Brucedale vineyard and total 68 acres of land. Currently the vineyard has 9.5 acres planted of Gewurztraminer, Riesling, and Pinot Gris vines. These two vineyard have future plantings planned. This vineyard is situated south of the Lake Ontario Shores and experiences cool breezes that delay bud burst and ripening of the grapes. 11 acres of Riesling, Merlot and Cabernet Sauvignon varietals have been planted in 1998 & 2001. 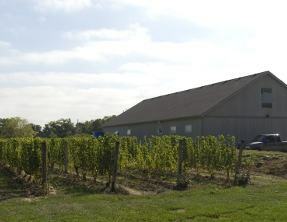 Planted in 1998, this vineyard is located in Niagara-on-the-Lake Ontario, where warmer climate and different soil composition provide a unique flavour for the grapes. The Gamay and Chardonnay grapes are produced here.